I’d been recommended to Cathy & Antony by another couple whose wedding I had photographed in Manchester last year. That wedding was at Didsbury House Hotel with Steph & Ade. Roll on a year and it was Cathy & Antony’s turn. 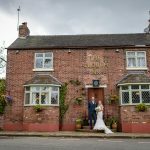 They’d chosen the very quirky People’s History Museum in Manchester for the ceremony and then the equally quirky Kings Arms just down the road for their reception. Cathy & Antony love everything to do with Manchester. 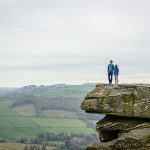 So their wedding had to be in Manchester and they’d combined these two amazing venues that had been on my photography wish list for a long while. I loved photographing this wedding around this new up and coming part of Spinningfields and combined with the People’s History Museum wedding photography it made for a very unique day. 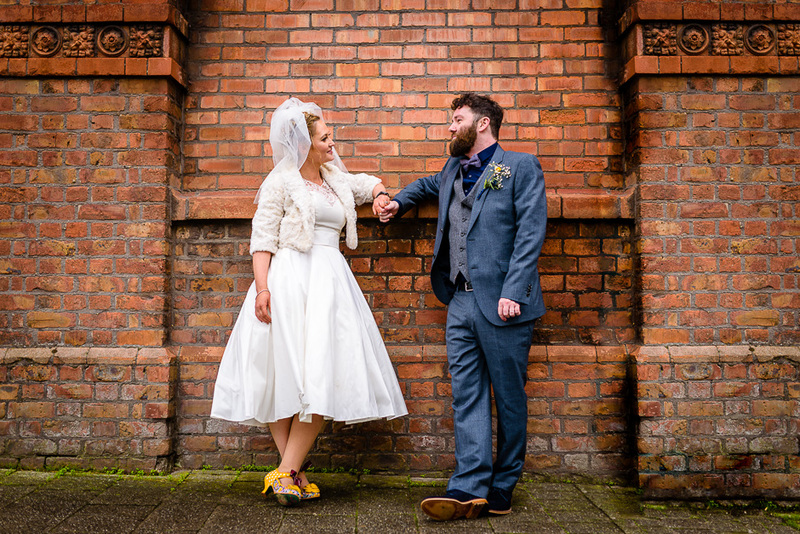 Cathy looked amazing in her dress, the ideal choice for this cool Manchester wedding. The chaps weren’t to be outdone either in their tweed jackets and bow ties. Keep a look out for the puppets in the ceremony! 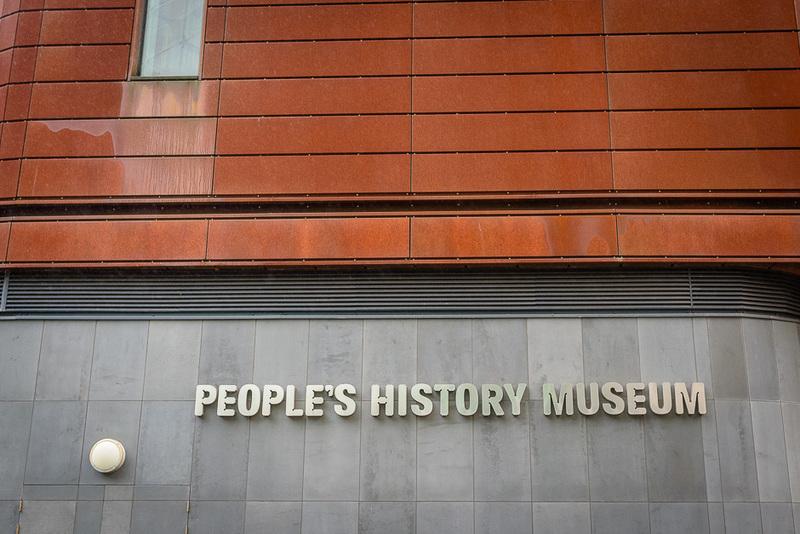 The Manchester weather couldn’t make it’s mind up for most of the day but it did at least stay dry for the group shots, which we took on the museum terrace and banks of the River Irwell. Unfortunately after this the Manchester drizzle set in and I thought that might put a dampener on the bride and groom photos. Not a chance, Cathy opened up her umbrella and off we went and it certainly made for a Manchester wedding to remember. The Kings Arms is quite a famous place around these parts. It has regular live music and hosts theatre productions which is why it is so close to Cathy’s heart, being an actor herself. The pub is/was owned by ex Housemartins/Beautiful South singer Paul Heaton. 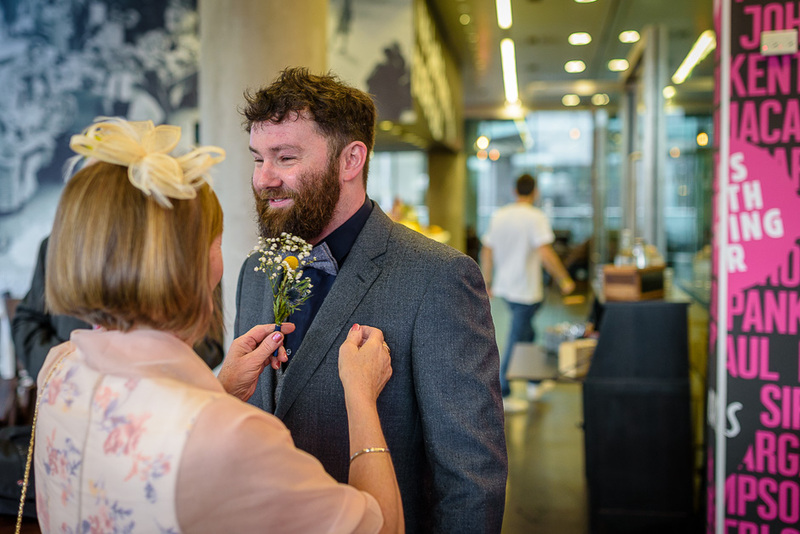 Before I left Cathy wasn’t to be outdone by the amount of beards on show and donned her own but what else would you expect for this quirky Manchester wedding! Cathy and Antony, thank you both so much, this is your story….